On Thursday morning, while almost the whole group departed for the airport to head back to the states, Eric, Jared, and myself stayed behind. We all decided to stay after the program ended, so we were afforded the luxury of sleeping in while everyone else had to depart before 5 am. After we woke up, the three of us sat on the porch while overlooking the Alps, and we slowly realized we were now completely on our own. We headed down to the train station to make our way to Munich, where we will be staying until we officially depart. I leave Monday, Jared leaves Sunday, and Eric is going to stay with family after we leave. Once we arrived at our hostel, we were absolutely exhausted; so, we all partook in a 3-hour power nap before our adventure really began. After our nap, we headed downstairs to the lobby area where we met people from all over the world. We met a group of British guys, a group of Australian girls, a dive instructor from the Bahamas, a Canadian, and more. It was really incredible to sit around and share our stories with them while they shared what they had experienced on their travels. By far the most interesting story we heard was from the dive instructor when he told us how we ran with the bulls in Spain. We didn’t stay out too late, because the next day we had a big day planned. 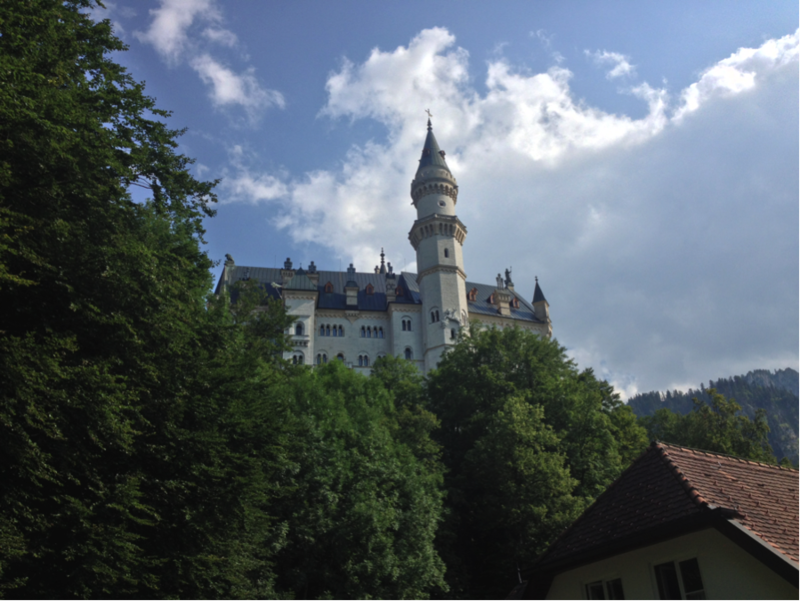 The next morning we woke up early and headed to the border of Austria and Germany to see Neuschwanstein Castle. This is the castle that Walt Disney modeled Cinderella’s Castle after that is currently in Disney World. It was about a two-hour train ride to the location but well worth the time and energy. 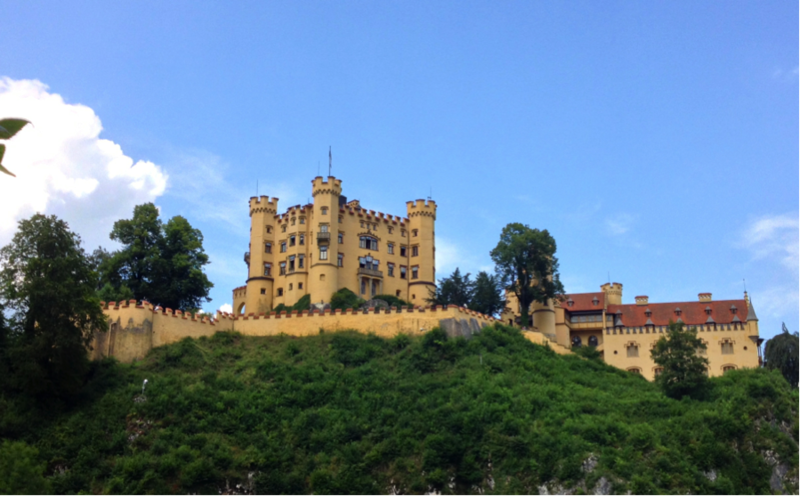 We actually saw another castle as well, Hohenschwangau Castle, which wasn’t as magnificent but still amazing to see. There was also a beautiful lake that we sat by and just relaxed, enjoying one of our last days in Germany. After the short but amazing tour, we headed back to the train station and headed back to our Hostel in Munich. We have one more day and who knows what tomorrow will bring…. World War 2 is my favorite period of history to study; I’ve enjoyed it since the third grade. 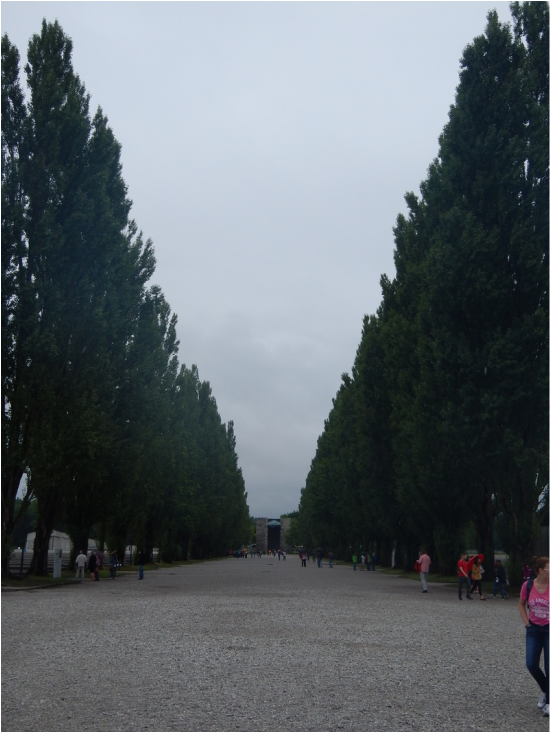 You learn about the Holocaust for years, but you never really understand it until a day like today, because today, we visited the Dachau concentration camp. We set out at a reasonable time in the morning and caught the 9:18 train. The weather matched the mood – a somber grey sky hung above us. Dr. Leder had told Jared and myself that when we were there we were to be respectful, because 40,000 people had been killed there. He had also recommended the audio guide for us to use because it contained more insight than what we would have if we walked it by ourselves. We boarded the train and within the next two hours we had arrived. As I approached the Jourhaus—the main entrance to the facility—I suddenly became filled with dread. I was anxious, my stomach curled, as much as I was fascinated by this time in history I couldn’t stomach where I was about to enter. I was afraid of what was on the other side. I walked through the gate that read “Arbeit macht frei” translated into English as “Work will make you free”. At that point I started my audio guide and at that point I separated myself from the group. The 5-acre prisoner’s camp was unbelievably huge, something I had not expected. I looked out over the grounds where roll call took place and began to wander. We had been told to view the 22-minute film covering the history of Dachau until its liberation on the 29th of April 1945. They showed the film in English at 12:30 and displayed pictures of Dachau and the atrocities that took place there. It was raining when we left the theater. I put on my rain jacket and headed to the replica of the bunkers the prisoners slept in. It was a small facility whose rooms were designed to hold 200 prisoners. My audio guide informed me that by the end of the war the rooms held 2,000 prisoners and at that time a Typhoid epidemic broke out killing thousands. That weighed heavily on my mind as I stepped out back into the rain. The rain began to pour as I made my way down the main road of the camp. 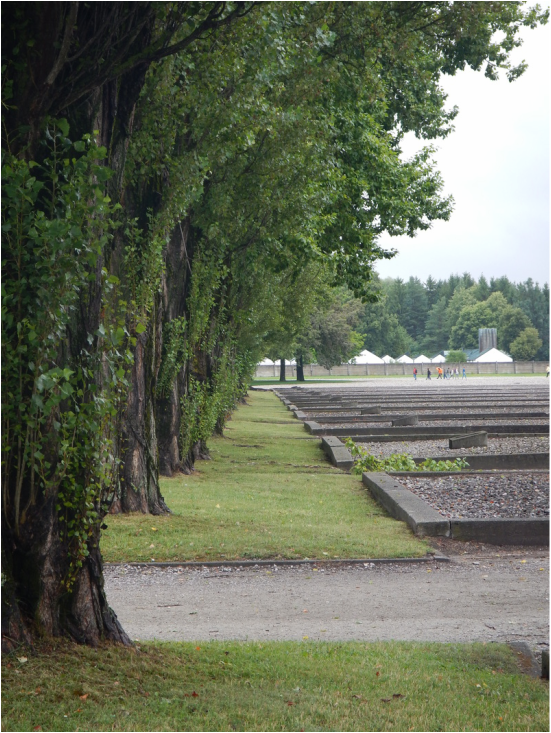 I listened about the experiments conducted by Heinrich Himmler as I walked out to a more secluded location between where bunkers 3 and 5 stood. I looked out over the foundations of where prisoners were forced to stay and where they died. A tear mixed with rain as I walked away. It seems like throughout this program, the weather has very appropriately matched the mood of each day. The very elements themselves, instead of dictating the course of each day to us, have reflected our own internal temperaments back upon us in an external display, be it of cold, heat, rain, wind, or clouds. Fittingly, today’s weather was dreary and wet; as the rains poured down and a chill slowly settled on our Brannenburg hotel, so too did a chill set upon us as the weight of our impending coursework, term paper, and final project deadlines slowly settled their (somewhat immense and only slightly figurative) mass upon our shoulders. It was a full day of class – the first day of nothing but class – completely without any hint of excursion or adventure, save the ultimately futile quest of finding some nook or cranny in the hotel wherein reliable Wi-Fi could be coaxed into our laptops’ wireless adapters, which are ever parched of internet connectivity. Our spirits and minds seemed to move as slowly as the loading bars on our webpages. The HNRS 2020 students had drafts to complete, peer review, and edit, and the IE 4785 students settled in to brave the long, winter-like wait while their sources’ pages grindingly loaded. Despite all efforts to invigorate the class, we moved through the morning as though in a daze, neither entirely aware of our surroundings (for the deadlines took precedence over all senses, including spatial awareness) nor truly feeling like ourselves. Yet as odd and as dreary as the morning seemed to be, we made headway on our papers and projects. The journey of 2000 words begins, after all, with a single letter. The brief oasis in our desert of lethargy and slow productivity was lunchtime. As the hotel’s severs brought out the entrée of chicken cordon bleu and the vanilla yogurt dessert, smiles slowly emerged, and soon everyone, as amused at the bleak atmosphere of the morning in hindsight as they had been caught up in it, was engaged in the usual merry conversation that accompanies all our meals. The sky showed no signs of brightening as the usual post-lunch drowsiness, accentuated and compounded by the mood of the day and the tasks at hand, enveloped us. One by one we fell to the urge to nap, to play pool, or to otherwise distract ourselves from the impending doom. Like the moon in the Majora’s Mask video game, though, which threatens to crash into the earth unless the player wins within three days, the deadlines continue to loom, unhindered by the passage of time. The countdown continues. At noon, it was the dawn of the 2nd day: 48 hours remained. Whether through a nap or the slow decay of productive afternoon time, dinner caught up with us. Chicken wings and fries invigorated us, and productivity resumed along with good cheer in the evening. It seemed as though we had finally woken up, and just in time; my classmates and I have work to do, after all, but in the end, we’ll have made something to be proud of. And when the sun shines out, it’ll shine out the clearer. Some things just don’t change when it comes to a group of college students. Like an average Sunday in Baton Rouge, today we took naps to catch up on sleep after a long weekend. Victoria and I napped all day and were only convinced to wake up by the promises of cake and coffee from Mrs. Paige. After some caffeine and a brisk walk at Paige Pace, we were awake and ready to take on the day. The second half of Sunday, as every engineering student knows, is a time to catch up on all of the procrastinated work from the weekend. We all proceeded to sit on the balcony, watch the rainstorm, and work on our projects. 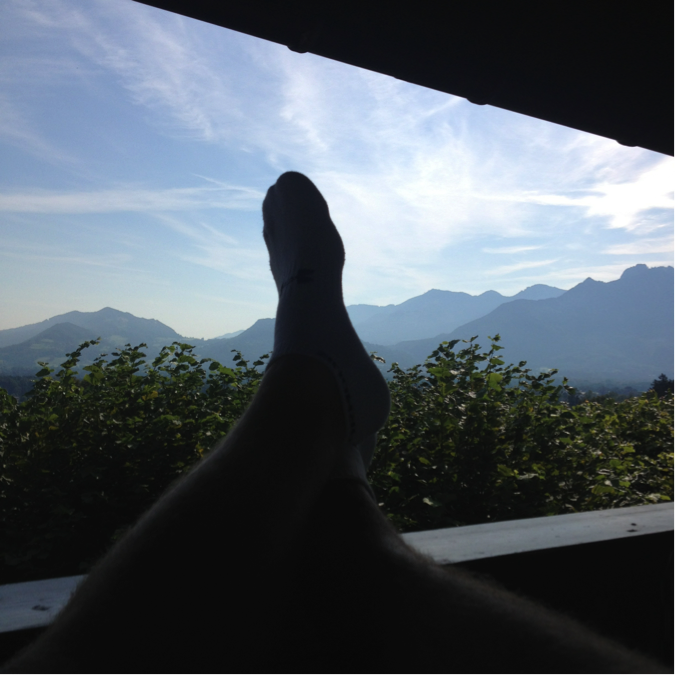 As it turns out, it is a lot easier to enjoy homework with a view of the Alps in your backyard. By the time we all finished our homework, we were able to enjoy a few quick games of ping-pong before bed. We all took a break from the monotony of staring at computer screens and trying to work on our final projects to travel into Brannenburg to Café Dauzer, whose reputation for having delicious cakes had motivated me throughout the morning. Kaffee und Kuchen is the German Coffee and Cake time in between lunch and dinner, and I was definitely a willing participant in this tradition. The selection of brightly colored cakes and pastries lined the displays, tempting our taste buds to try something new. I had a raspberry chocolate slice of cake that was approximately the size of some of the smaller dogs we’ve been seeing around town. We made the short uphill climb back to the hotel, just barely making it back in time to avoid the “hurricane” that had been looming overhead all morning. This short afternoon treat provided some much needed motivation to stay awake and make some headway on our work. 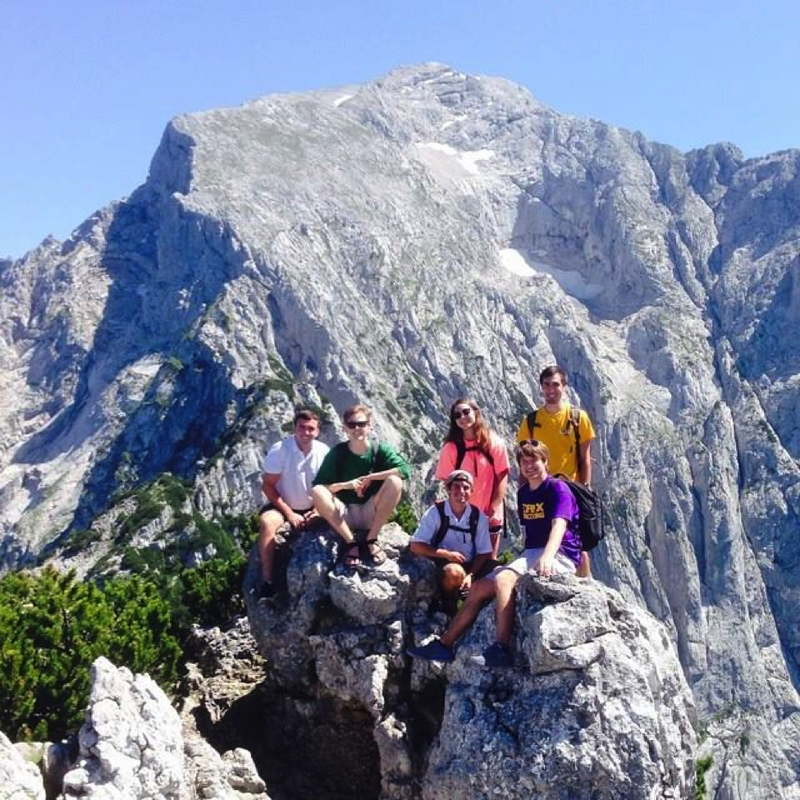 For the Saturday of our free weekend, six of the people in our group traveled to the Eagle’s Nest in Berchtesgaden, Germany. The group consisted of myself, Connor, Eric, Nathan, Alex, and Anna. We set out from Brannenberg at 9:18 and took a train to Rosenheim. About halfway through that ten minute ride, the train driver hit the brakes and the train screeched to a halt. This worried all of us because we had less than 5 minutes to switch trains in Rosenheim. Every minute that we sat on the tracks stopped was less time for us to be able to make our connection. We ended up making that connection as well as our final one. We arrived in Berchtesgaden around 11:30. We took a bus to the documentation center and immediately got in line to buy tickets for the bus ride to the top. We had been told by Dr. Leder and Ms. Davis how steep the mountain bus ride was but we all chose to sit next to windows so we could see. 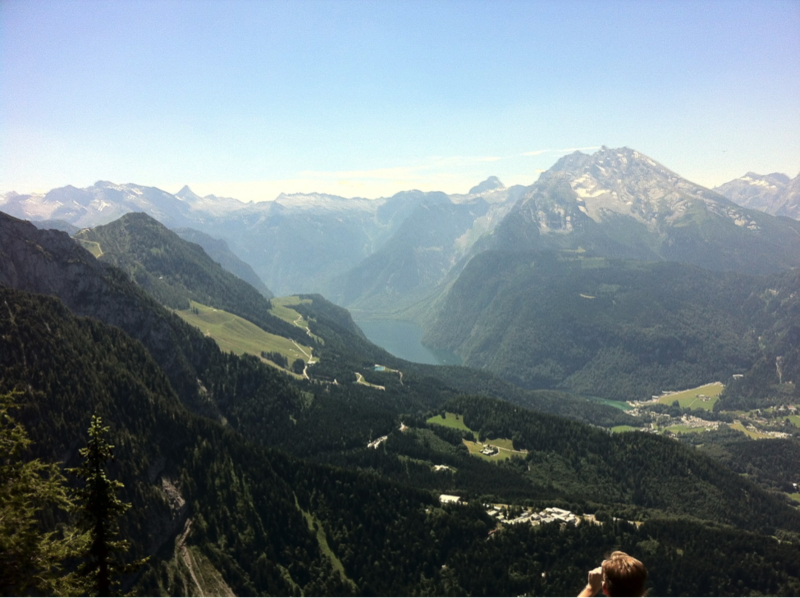 The view from the top of the Eagle’s Nest was breathtaking. You could see for miles in all directions. We took the golden elevator up to the very top and began our adventure atop the Eagle’s Nest. We didn’t spend much time inside the building but instead climbed the rocks and walked the trails near the building. At one point, we were all able to climb up to the highest point on the mountain and take breathtaking pictures. After that, Nathan, Connor and I went hiking further down the mountain. It got really steep and slippery at times but we were able to hike to a clearing without any major problems. We then realized we didn’t have much time until we were supposed to be back on the bus to go down. So, we rushed back over to the building and waited in line to take the elevator down to the bus stop. Eric however decided that the line was too long and walked off. We thought the bus was going to leave him, but sure enough he showed up just in time to get on the bus with us. He had walked down the mountain instead of waiting in line and taking the elevator. After the beautiful bus ride back down the mountain, we walked over to the documentation center. Unfortunately we only had 30 minutes to look around inside. Our main thing we wanted to see in the museum was Hitler’s bunker. It was a massive labyrinth of concrete under the mountain. It was weird thinking that I was walking where he had walked over 70 years ago. Around 4:55 pm we headed back up and took the bus back to the train station. For dinner, we went to a Chinese restaurant across from the station that Dr. Leder suggested we try. 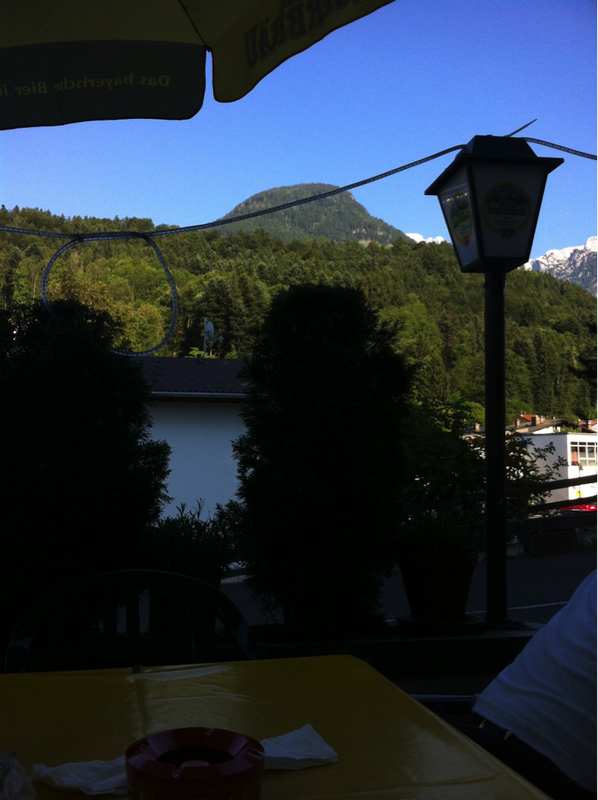 It was the best Chinese food that I have had in my life, and the view of the Alps sitting outside was beautiful. You can’t beat a dining experience where you face the mountains while you eat. We then took our three trains back to Brannenberg. After our long day and our 20 minute walk up the mountain to the hotel, we were exhausted. 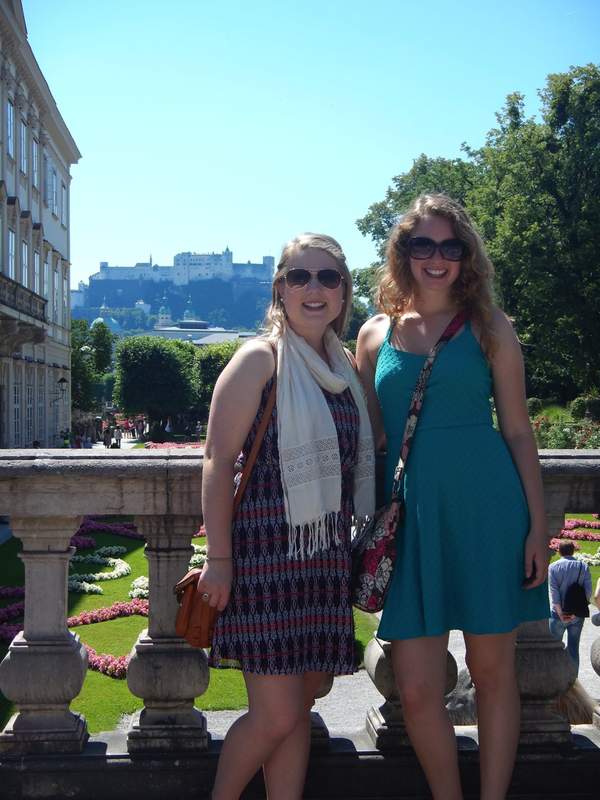 During the free weekend, Kathryn, Victoria, and I decided to head to Austria again to visit the city of Salzburg. 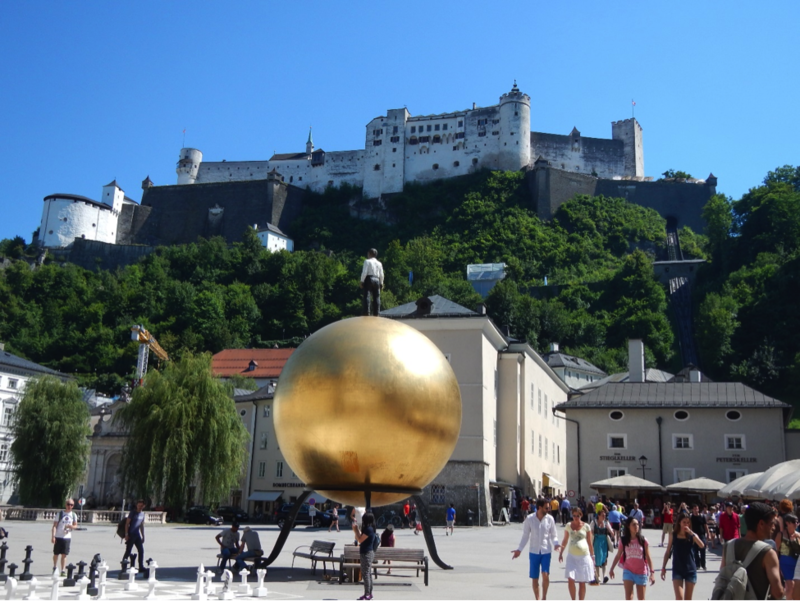 We knew the “Sound of Music” was filmed in the city, but we knew nothing more than that. We were more excited to explore and stumble upon sights. Once we arrived, we found a map, but it was in German. Luckily, there was a picture of a garden on the map and a number (#7) correlated to the picture. We said, “Let’s just go to #7,” and set off. As we followed the map, the three of us found a huge group of people with giant cameras around their necks headed in the same direction. When you’re a tourist in an unfamiliar city, that sight is always a good sign! As it turned out, #7 (the Mirabell Gardens) was amazing. The flowers and landscaping were pristine, and the fortress in the background provided for some fantastic photos. We may or may not have walked slowly by some English-speaking tours and overheard that Christian Doppler, the man who hypothesized the Doppler Effect, lived right outside of the gardens! After browsing around in a souvenir shop for a few minutes, the three of us got into a conversation with the owner of the shop. He informed us that the company, Red Bull, was founded in (or near) Salzburg, and the owner lives three minutes away. None of us knew Red Bull was an Austrian company, let alone from Salzburg. We spent the whole day wondering around and exploring a new city. We didn’t know where or what anything was, but we knew we would find sites, shops, and statues to explore. We had no direction and no destination, but we knew the journey would be fun and eventful. 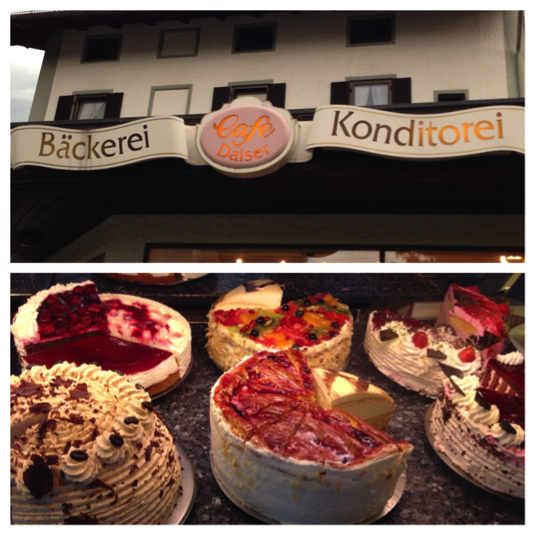 Salzburg surely did not disappoint! After spending a sweaty night tossing, turning, and trying desperately to get a few hours of sleep, I gave up and peeled the sheets off me to go find a cup of coffee and start the day. I settled down with my cup of coffee and a map to start plotting the day while everyone else was still waking up. I wasn’t really feeling up to navigating hot, sun-beaten streets of Munich overcrowded with tourists, but the English Garden seemed promising. Once the troops were assembled, we said goodbye to the 4 You Hostel and set out on our destination. The journey tested our navigational skills, but after hoping a couple trains and wandering around aimlessly, we finally found the garden. Well, “garden” is a little bit of an understatement. This place was an oasis of nature amongst the busy streets of Munich. The acres of broad trees provided relief from the heat, while the bustling river that ran through the middle of the park maintained a pleasant breeze, as well as unlimited entertainment. We followed the creek and tried to find a quiet and shady spot. However, to our pleasant surprise, we found a group of surfers riding the waves provided by a bridge that must have been some sort of dam. The waves would periodically pour out from underneath the bridge, and surfers would take turns riding them. 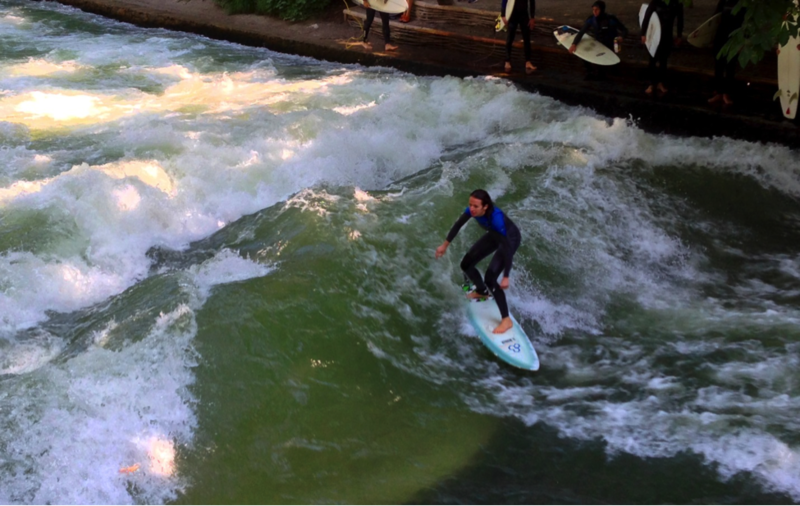 I never would have thought that there was any surfing in Germany, but every day of this trip has exceeded my expectations. We continued along the river until we came across a grassy patch where we settled down to rest. A couple of us dozed in and out of sleep while Jared, Connor, and Eric skipped rocks in the river. Apparently rock-skipping is unheard of in Europe, and the three of them caught the attention of several bystanders. We hung out by the river for a few hours, relaxing. I could have stayed there and enjoyed the tranquility for the rest of the day, but we had things to do and places to be. After the park we took a tram to Karlzplatz, where we enjoyed as much as we could of the shopping and eating that the beautiful city of Munich has to offer. This afternoon marked our final excursion of the week before our free weekend began and our last afternoon with Bart, our fearless translator, without whom we would have been lost many times over the course of the trip. 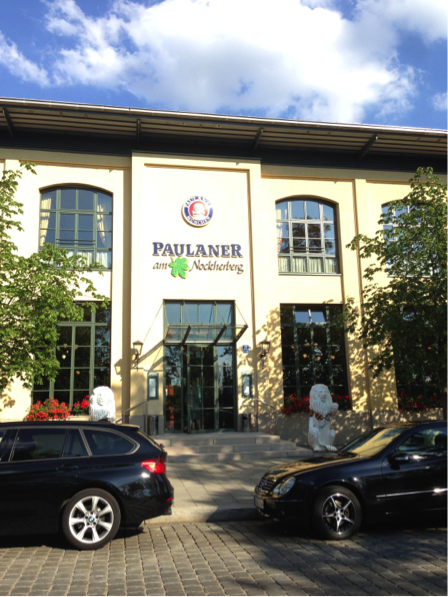 We arrived at the Paulaner Brewery in the heart of Munich to discover exactly how beer, which is so iconic and famous in Germany, is made. The tour began with a quick video of the company and an overview of the process. We then took a walking tour of the brewery in order to see each of the steps of the process in action. One of the reasons beer in Germany is so proclaimed is because German brewers still today follow the rules of the German Purity Law, a document put into effect in the 1500s that only allows four ingredients in beer: water, barley, hops, and yeast. This law historically kept beer cheap and free from any unhealthy ingredients. We learned that in Munich, only the breweries are allowed to have deep-water wells to obtain water that they use to brew the beer – no other businesses can tap into that water. Also, there are large farms on the outskirts of the city that grow hops which all of the breweries in Germany use. We then moved on to see the mashing process, boiling process, both parts of the fermentation process, and finally, the bottling and kegging process. 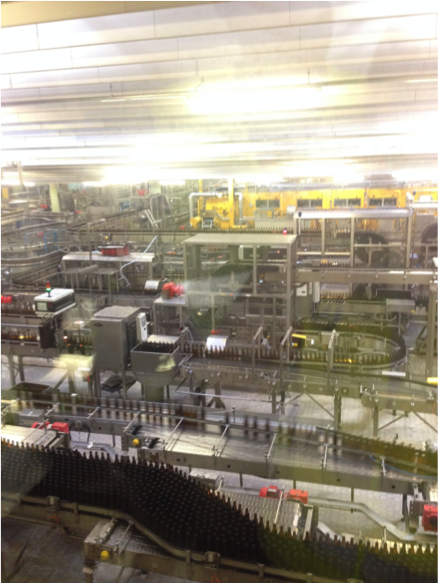 The brewery bottles 38,000 bottles of beer per minute everyday, which is an astounding amount of beer. The tour concluded in the brewery’s restaurant, where a meal of pork and potatoes was served, complete with a complimentary taste of beer. Today we visited Corratec. It started with meeting the owner and founder of the company and a presentation from their lead designer. The presentation was very interesting, and for every bicycle part described, the designer had a real example that we were able to hold and pass around the room. Some of the examples were carbon fiber bike frames. It was amazing how light the material was. I was able to lift a whole bike frame with just one finger. After the presentation, he showed how they turned simple materials into high-tech bikes. Their high priced examples were astounding. Throughout the week, I have seen electric bikes all around Munich and in the BMW factory shop. I was so curious about how it operated. Toward the end of the tour, the designer showed us his office. When we walked in, there were solid works drawings on the computer and the most up-to-date versions of the latest bikes, including two e-bikes. While the rest of the crew looked around the office, I talked to the developers. It was unlike all the tours we had before because the access we were given like talking and asking questions to the individuals that designed the bike. To top that off, they asked us if we wanted to ride them. Thrilled with excitement, I beat the designers and the rest of the class to the bottom of the stairs to ride the black e-bike that was capable of 40 km per hour. The engineer explained the pedelec system with the eco, standard, and turbo settings of the bike. The pedelec system pushed me forward when I applied a slight force to the pedal. I thoroughly enjoyed our morning with the bike experts.